I’ve been traveling of late and found myself at a very nice wine and cheese bar with my husband. Even though I had a bottle of Scharffenberger Cellars Brut Excellence at home, I choose it to complement our cheese plate. It was the right choice. I have always enjoyed Scharffenberger’s sparkling wine. It is a staple in our wine chiller. Scharffenberger Cellars, founded by John Scharffenberger, is located in the heart of Anderson Valley, California. Scharffenberger Cellars were established in 1981. Having gone through many changes, they are now managed by Maisons Marques & Domaines. Today, they’re recognized for their high quality sparkling wine. Scharffenberger Cellars is nestled in the gently rolling hills of Anderson Valley not far from the rugged and beautiful Mendocino Coastline. You’ll find them just outside the tiny town of Philo, due north of San Francisco. Their tasting room regularly features new local artists. It’s a special treat while you enjoy tasting their current offering of sparkling wines. 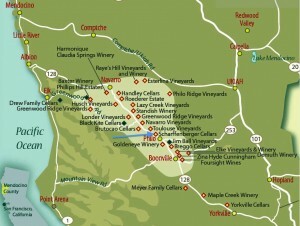 Anderson Valley is known for their Pinot Noir and Alsace Varietals. 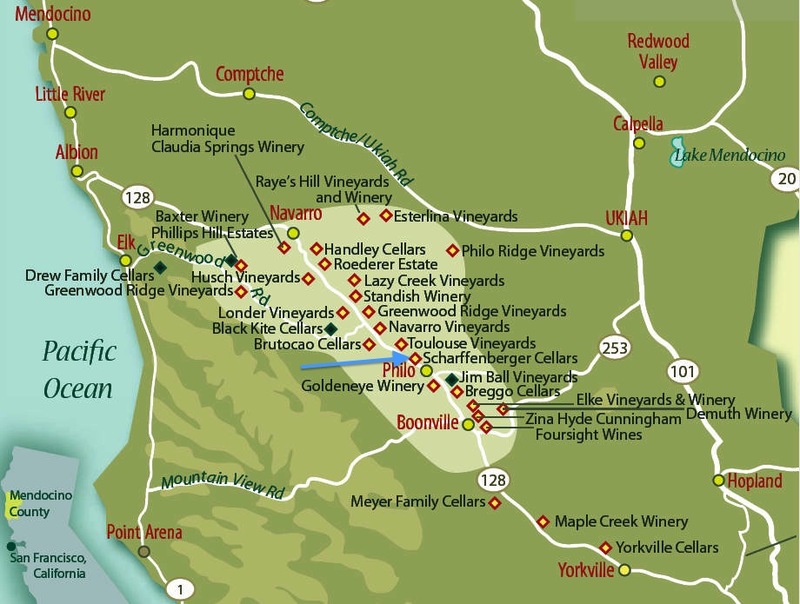 An interesting fact is the valley is only fifteen miles long, home to a unique group of vineyards and wineries producing a broad range of excellent wines. It’s a fun destination certainly deserving some exploration. For something delightful and fun and for a modest price, call ahead, and they’ll provide a picnic with a glass of wine in their gardens or on their porch. Doesn’t that sound marvelous? This sparkling wine is consistently good. It is always a good choice when I’m undecided about what I want to serve for a celebration or just for a bit of fun. It is also an excellent choice for Mother’s’ Day. 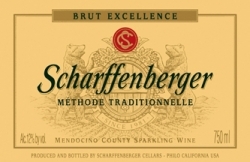 You can find Scharffenberger Cellars Brut Excellence on their website, wine.com, totalwines.com, Bevmo.com, Costco.com, CostPlus/World Market and any good wine purveyor. If you enjoyed reading about Scharffenberger Cellars Brut Excellence, check out Cameron Hughes Lot 311 Moscato d’Asti 2011, Veuve Clicquot Yellow Label Brut Champagne, and Risata Moscato d’Asti.